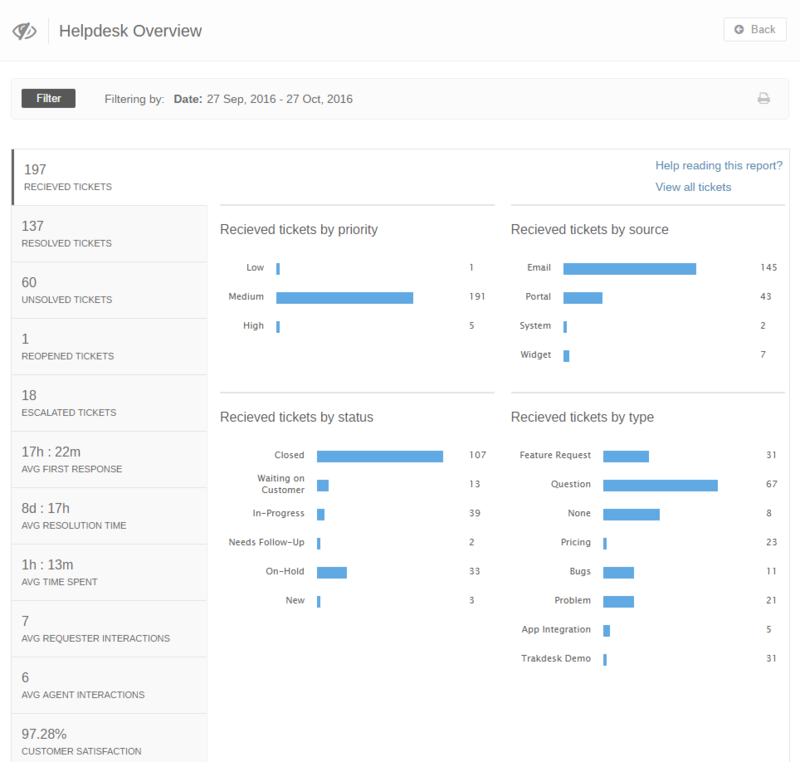 The Helpdesk overview report in trakdesk gives you a full analysis of you helpdesk performance in a single view. It also enables you to compare key ticket metrics in your helpdesk so you can analyze your helpdesk performance from different dimensions. The Helpdesk overview report consists of thirteen (13) different key ticket metrics. You can completely interact with each metric and its categories by clicking on any option in each category. Understanding the Helpdesk Load Report. The number of new tickets created during the filtered time period. The number of tickets that were resolved during the filtered time period. The number of unresolved tickets in your helpdesk during the filtered time period. The number of tickets that were initially closed, but were later placed into an open ticket status during the filtered time period. The number of tickets that were escalated from one agent group to another during the filtered time period. The average amount of time it took an agent to post a internal or public comment in a ticket during the filtered time period. The average amount of time it took an agent to resolve a ticket from the time it was created during the filtered time period. The average amount of time an agent spend on a ticket during the filtered time period. The average number of comments the ticket requester post in a ticket during the filtered time period. The average number of comments an agent post in a ticket during the filtered time period. The percentage of customer satisfaction survey during the filtered time period. The percentage of SLA response due violations that occurred during the filtered time period. The percentage of SLA resolution due violations that occurred during the filtered time period. Exporting your data in Trakdesk is quite easy and fun. You can literally click on each ticket metric and export only that portion of tickets. For example: Lets say you want to export all Received tickets that were created via Email. To do this, simply click on the email option under the Received tickets by source category. All tickets will be displayed in the export tickets modal, you can preview the tickets by scrolling up and down before exporting them. In addition, you can export all tickets for each metric by clicking on the View all tickets option at the top of the report.